We going to take over earth! And enslave all you pitiful Earthlings! The Fantastic Four says we can’t have those Skrull guys. 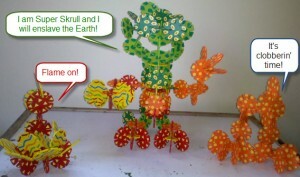 The Super Skrull has all our powers, but we must defeat him!